The chronology, especially of April 1945, is not always quite clear due to contradictory reports. April 26: About 3500 seriously ill concentration camp prisoners from the Kaufering concentration camps are put into freights car destined for extermination in the Dachau camp (Grinberg, May 31, 1945). April 27: The train arrives at Schwabhausen where the SS leaves it exposed on the rails as bait for the ongoing Allied air raids. At 10:20 h the French bomb squadron „Navarre“ attacks the train. About 140 prisoners are killed, but about 400-500 escape and hide in the woods, many heavily wounded and nearly all completely emaciated and ill. The train leaves without them for Dachau. April 28: Dr. Zalman Grinberg arranges the transport of about 50 heavily wounded prisoners to the nearby monastery of St. Ottilien which at this time was being used as a German military hospital after the expulsion of the monks. April 29: The 4th US Infantry Division reaches the Landsberg region. 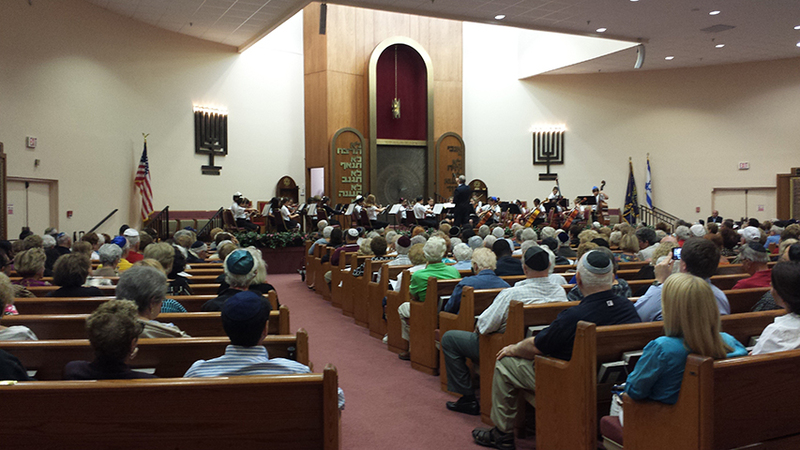 May 1: First burial of a former concentration camp prisoner (Lewin Mertel) by Rabbi Weiss. The American occupation force demands that all the German doctors, nurses and soldiers in the hospital are present at the Jewish ceremony. In the following weeks a part of the German patients are brought away to other hospitals. June: Under the leadership of three Jewish doctors (Dr. Zalman Grinberg, Dr. Nochum Katz, Dr. Zalman Berman) the German medical staff (doctors and nurses) is continuing its work for liberated camp prisoners. 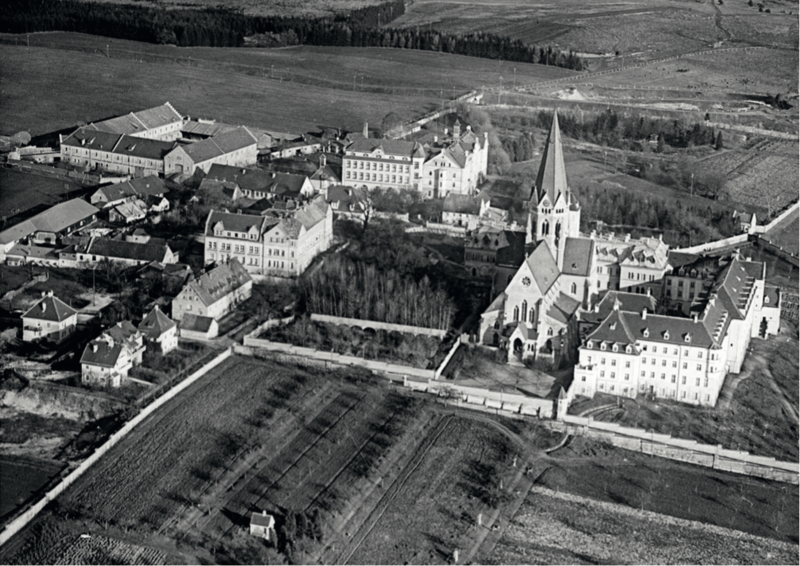 Dr. Grinberg has an agreement with Chaplain Abraham J. Klausner that all Jewish patients from Dachau should be brought to St. Ottilien (soon after a second Jewish hospital opens in Gauting). July 25–26: First Conference of liberated Jews from all zones (94 delegates from 46 DP camps) with the election of a Central Committee and declaration of a program with fourteen points: recognition of Jews as their own nation, Israel as a homeland, compensation of concentration camp prisoners, self-administration of the camps etc. Dr. Zalman Grinberg becomes its first president, a position he holds until his emigration in July 1946. 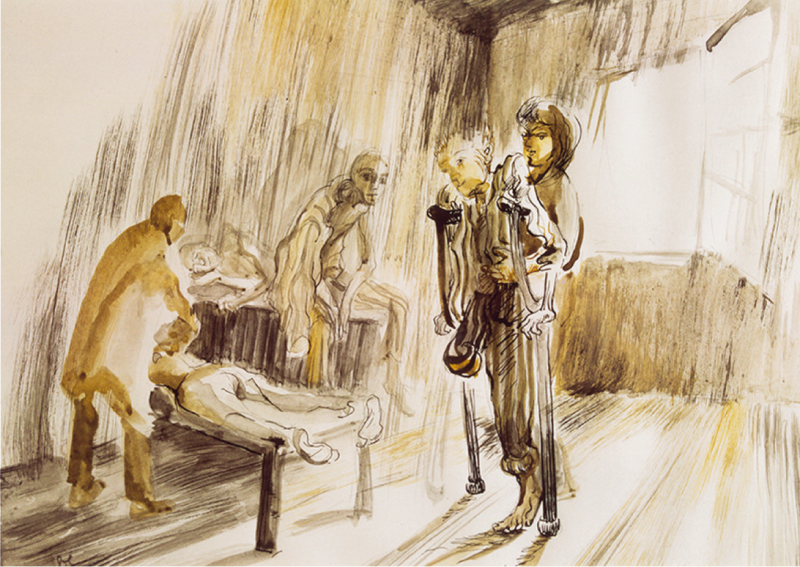 August: The last German patients are brought away. August 28: 153 children between 2 to 15 years are registered in St. Ottilien who wait for a boat to Palestine. August 31: Rabbi Judah Nadich visits with Joseph Schwartz (JDC) the Hospital. He describes the hospital work with its 785 patients and especially the children department (Eisenhower and the Jews, p. 84-87). December 29: Foundation of the children Kibbuz „Atid“ in the theatre room of the monastery school. David Arownoski is in charge of the group. June: Two Talmud volumes are printed in the Press of the monastery (3000 copies). They are edited by Rabbi Samuel Abba Snieg and Rabbi Samuel Jakob Rose. Rabbi Snieg has started a Yeshiva (Torah School) in St. Ottilien which builds up a library of Jewish literature. The Rabbis Snieg and Rose prepare a reprint of the complete edition of the Talmud in 19 volumes which is done from December 1948 to November 1950 in Heidelberg. The cover image shows the abandoned concentration camp of Kaufering. June 11 and 14: The chess club of the DP camp Landsberg travels to St. Ottilien for a match, and three days later the Ottilien chess club travels to the rematch in Landsberg. Both times the players from Landsberg win with 5 1/2 : 4 1/2. July: Dr. Zalman Grinberg emigrates to Israel. His successor as president of the Central Committee is Dawid Treger, also from Kovno. The St. Ottilien DP Orchestra moves to Fürstenfeldbruck and becomes the „Ex-Concentration Camp Orchestra“. September 1 to 15: At the „chess olympics“ at Landsberg, players from 15 Jewish DP camps take part. It is won by Ch. Aleksandrow from the Ottilien hospital. About this event see the article. March to July: The monastery wing is completely returned to the monks. The medical staff located there moves to the school building, the operating rooms, x-ray facility and dispensary follow in July. November 1: The Procure St. Paulus (served as store room for the Hospital) is returned to the monks. The Jewish Camp Police reduces her controls to the downsized Hospital, i.e. access to the monastery is possible without passing a checkpoint. December 9: 299 people registered (134 patients). According to an IRO report about 350 books in the hospital library. The same report recommends a transfer of the maternity ward into the monastery because the present building has only one staircase which would be dangerous in the case of fire.